When you are a teacher, getting feedback from your students can be quite daunting. However, it also comes with a number of significant benefits. Not only will you be able to improve your techniques in teaching, but enabling a course evaluation will also promote regular discourse between you and your students, thus making for an interactive and open classroom atmosphere. 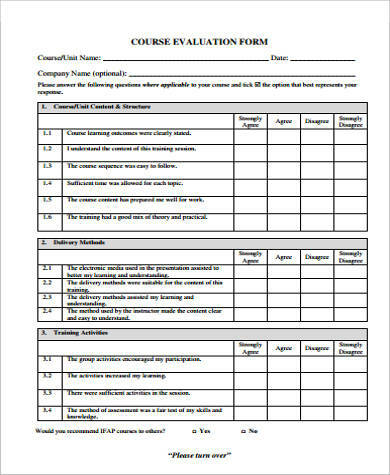 Most of the time, evaluation forms are implemented and produced by the administrative department of an educational institution. 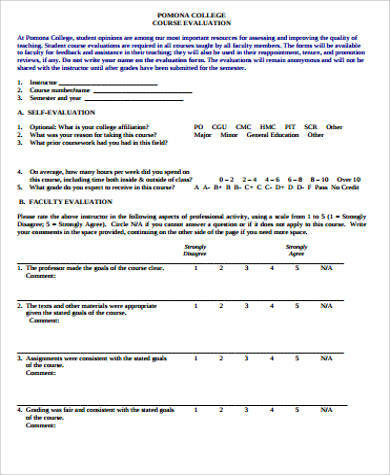 However, some schools and universities allow their faculty to produce their own evaluation forms. 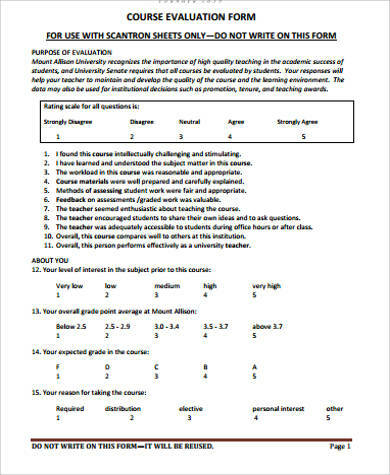 If you are planning to have your students evaluate your class, you can use these Sample Evaluations as one of your references. Encourages and bolsters communication between you and your students. 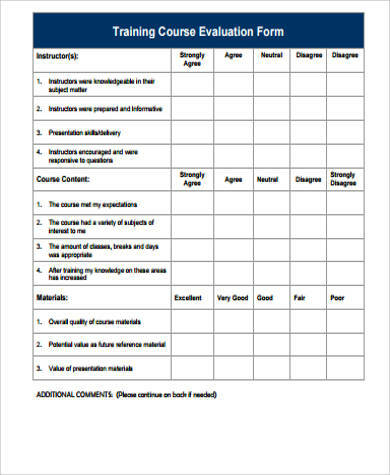 Conducting a course evaluation promotes healthy and effective discourse between you and your students as being open to an evaluation signifies that you are interested in what your students have to say. When communication is strengthened in a classroom setting, the students’ learning progress is likely to be more smooth and rapid. Helps in creating a more immersive classroom environment. Letting your students know that you are open to hearing their opinions of you and your teaching style allows them to feel more involved in the classroom and in making the course more substantial and interesting. 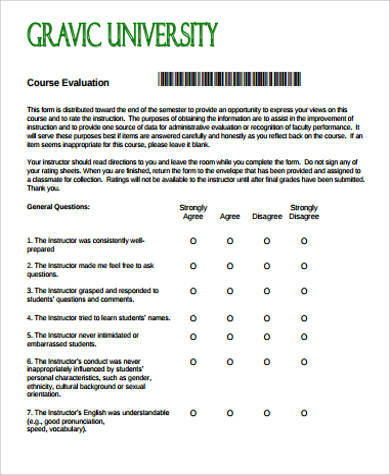 A course evaluation can be the first step to a more engaging classroom atmosphere. Students are also able to evaluate themselves in the process. 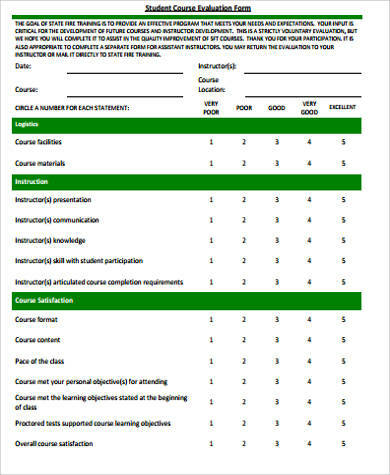 Much like the use of Employee Self Evaluation Forms in the context of employment where workers assess their performance, a course evaluation can also entail self-evaluation for the students. They are able to reflect on their performance and contributions to the course. 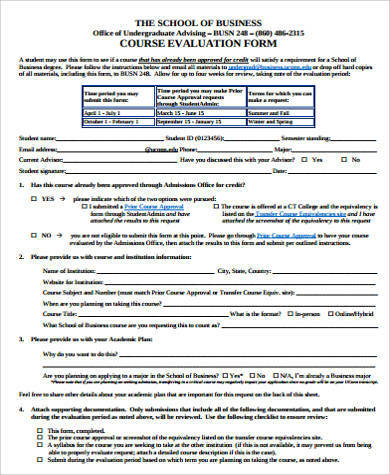 The format of course evaluation forms are no different from Peer Evaluation Forms and other types of evaluation forms used to assess the quality and effectiveness of an individual or a certain function. Commonly, a numerical rating scale is used for evaluation. Higher numbers represent positive feedback (e.g. satisfactory or very good), whereas lower numbers signify negative feedback (e.g. not satisfactory or poor). 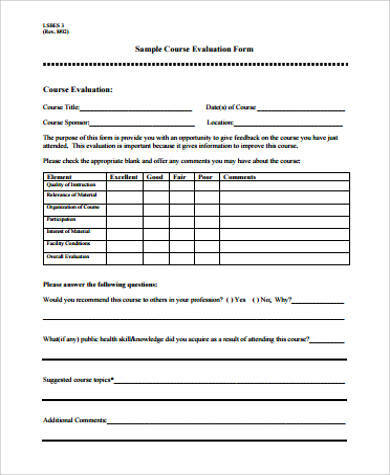 The questions typically asked in course evaluation forms center mostly on the methods used by the course instructor or teacher, and of course, the substance of the course. The questions serve to measure the effectiveness of a teacher’s techniques in delivering the lessons and lectures to the students. 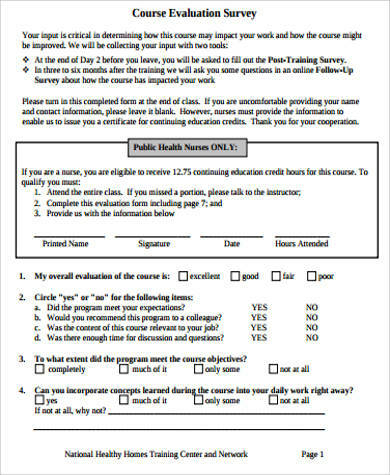 At times, educational institutions employ a different format when it comes to conducting course evaluations. 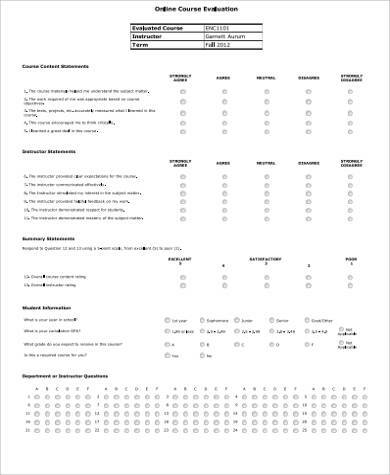 The forms distributed to students contain questions that the students have to answer directly, not through a rating scale. This particular means encourages students to elaborate their opinions on the instructor or teacher. Moreover, it also allows them to make suggestions directly, particularly on what can be improved to make the course or class a greater experience. Many novice teachers find getting feedback from their students an intimidating prospect. However, there is absolutely no disadvantage in a course evaluation. If anything, it entails reaping many significant benefits.